When doing design work with students, I find the most difficult thing to get over to them is the design development stage. They all want to do one design idea and rush on to the final thing. They have trouble understanding the point of doing more design work and working through a process. 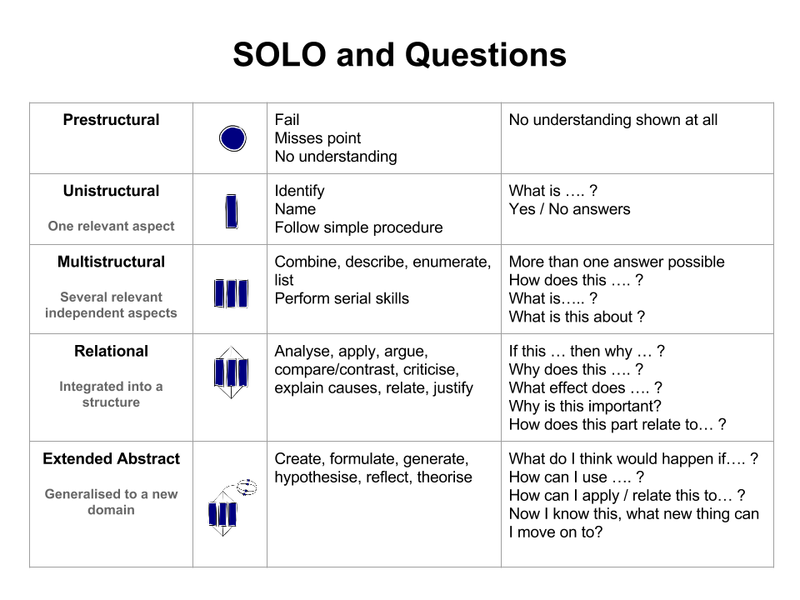 To help with this, I have started looking at how I can use SOLO to structure the process of design development. Earlier this year, I made this questions sheet to refer to when helping students analyse their research work. I thought that this could also be the starting point to make the steps through design development. Unistructural - they identify the main features of existing products that are similar to what they are thinking about designing. Multistructural - they combine elements of what they have researched and list / label / describe the main design elements they have included. Relational - analyse what they have drawn already in terms of shape and add design elements. These decisions are analysed and explained. Extended abstract - further development drawing fulling successful elements together. Analysis explaining next steps. Here is the support work I put together for this and I have tried it out on my Year 10 group. I have had all of my planning online in the form of Google sites for a few years now. The students access the sites to get instructions, links, resources etc about the projects we are working on. Link to class site here. As a department, we have been working on making the Technology Achievement Objectives more accessible and understandable for the Y7-Y10 students. We have worked on Level 1 to level 5 so we can show a clear pathway from our intermediates who come in for their Technology lessons through to our Year 9 and 10 students at the college. This has been a really useful exercise for me as it made it really clear where the gaps are in my planning and make sure all the curriculum requirements are covered over a project. As a school, we are moving towards "Visible Learning", where it is made really clear for the students why they are doing activities and what they are linked to. Justify the nature of an intended outcome in relation to the need or opportunity. Describe specifications that reflect key stakeholder feedback and that will inform the development of an outcome and its evaluation. Design brief written up on a Google Doc. Work in groups to decide what would be good questions to ask the client / customer. Put ideas onto a shared Google Drawing. This is then posted in the community for all to see and use ideas from. Google form used to collect questionnaire information from client base. Students put form onto the class community to receive input. It can also be emailed out to targeted clients if needed. This form can be individual or in pairs. Pick out the key points / most popular attributes that need to be included in the design work. List these key points / specifications with the design brief. Link to Google Forms section on the How To site. Questions / writing frame structured around SOLO progression, building depth from unistructural to relational. Group work can be based around 3 levels of SOLO. Multistructural when listing attributes etc. Analyse their own and others’ planning practices to inform the selection and use of planning tools. Use these to support and justify planning decisions (including those relating to the management of resources) that will see the development of an outcome through to completion. Make and post examples of project breakdown / timelines / planning sheets. Students to make their own. Use a spreadsheet for tracking of class work as they do it, and make it available for all students to see it all the time. Google calendar embedded on class site for reference to timescale for tasks. Multistructural when listing jobs to be completed / tools needed etc.. Create a timeline of mobile phones through time to be able to see the changes that have happened - they can use google drawing / presentation / doc or any other means. Group discussion question in the community about how changes have occurred in phone design. They can all see each others answers on the community post. Analysis of a mobile phone of choice, using the SOLO question structure. This can be done on doc, presentation or drawing. Produce sketches / concepts and models based on results of questionnaire and research. These are then scanned and photographed. Use TinkerCad to develop a 3D model to print - take screenshots of development work as they go. Photographs of final design to be posted in the community for feedback from the whole class based on a given feedback structure. These photographs can be posted with the original specification points so comparisons can be made by the class. Write an evaluation of the final phone design / model based on the feedback received from the rest of the class. Compare and contrast / timeline work is Relational. Presentation template structured to take the students through from unistructural to extended abstract in terms of their types of analysis questions. Using research work for own ideas is Extended Abstract. This is structured to take students from sketches to models and back to sketches with analysis notes based on SOLO structure. Relational - when comparing shapes against each other and making judgements for design decisions. Understand how evidence, reasoning, and decision making in functional modelling contribute to the development of design concepts and how prototyping can be used to justify ongoing refinement of technological outcomes. Class discuss / draw and make comfortable shapes - what makes a comfortable shape, why does it have to be a comfortable shape? The work from the comfortable shapes exercise is then used to start creating concept ideas. Ideas developed on TinkerCad to think about them in virtual 3D modelling - screen shots taken and analysis done. Work to be posted in the class community for all to comment on and make suggestions for improvements. Reasons must be given for the suggestions. Final design to be printed on the 3D printer for a final prototype. When I tried to apply this to my NCEA standards for my seniors, I did not find it as easy. The achievement objectives go up to Level 8 of the curriculum, but it is not explicit anywhere how these link to the actual standards that we work on. Our Year 10 groups have been collapsed and these students have started NCEA Level 1 earl this year. This is a new thing for us and our DP asked us to make sure the students understood the LANGUAGE of NCEA. This gave me an idea of how to approach visible learning with them. This was done really easily on Google Drawings. 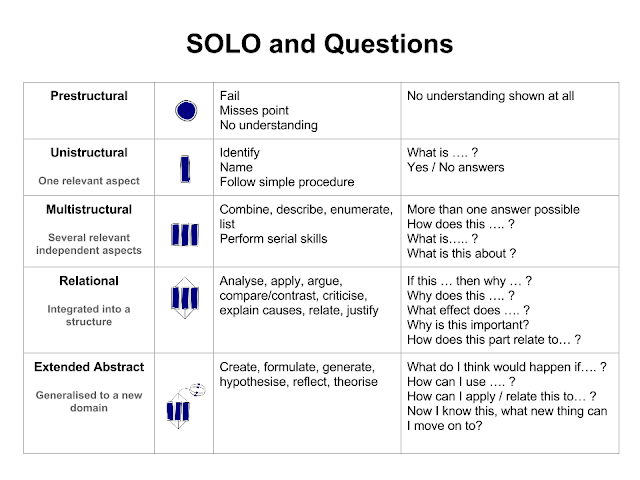 Here is the sheet that we are going to use..
What I need to add yet, is the SOLO taxonomy structure that is built into the planning of the project so it is obvious to the students where it fits in.